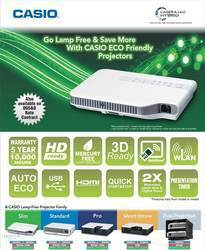 It is our pleasure to introduce Casio LED Laser Digital Hybrid Projectors to you. hybrid light source, which gives Zero maintenance trouble free life of over 20,000 hours including light source. These projectors are Made In Japan meant for 24/7 operation with a very low power consumption. and many more features with no maintenance makes it a rugged and durable offerings. Looking for LED Laser Hybrid Projectors ?